Kids have a skewed perception of the world. Adults seem impossibly tall. Magic could actually exist. "Garfield" seems funny. Writer Ariel Dumas has highlighted another skewed perception of childhood: Things that are not fancy have the potential to seem ultra-fancy. It's so subjective that it could be almost anything could fall into that category based on your circumstances. Dumas posed the question to followers on Twitter, "What was the thing you thought was VERY fancy as a kid that turned out not to be?" She helpfully offered her own response to get things going. "I thought Jägermeister was for sophisticated ladies because my mom sometimes sipped some out of a cordial glass at bedtime." Ok what was the thing you thought was VERY fancy as a kid that turned out not to be? I thought Jägermeister was for sophisticated ladies because my mom sometimes sipped some out of a cordial glass at bedtime. The question pulled in more than 7,000 responses. Many of them included Andes Mints, because, damn, that's a name-brand mint. Other popular answers involved upscale-ish fast-casual chains like Red Lobster and Outback Steakhouse. Those make sense because, well, lobster and steak. That's some fancy foodstuff. 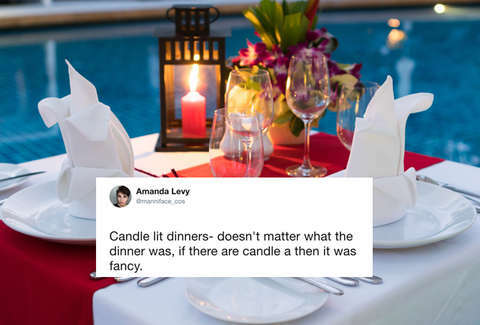 Candle lit dinners- doesn't matter what the dinner was, if there are candle a then it was fancy. I thought Red Lobster was for rich people. A fridge with a built-in ice dispenser - such luxury! Often when my dad would travel he’d bring me home a purple Crown Royal bag and I’d get so excited. My mom would get very mad and I never understood why until years later. On multiple levels. At the time I was like, why don’t you want me to have nice things, mom?! And tissues were super fancy; we blew our noses with toilet paper. My best friend’s dad would order us pizza, and after serving us, he would KEEP THE PIZZA BOX IN THE OVEN AND TURN THE OVEN ON WARM. I thought Piñatas were hundreds of dollars and only for really rich people. I was so mad when I found out they were affordable and I had only gotten one once. Here are some of the best non-food responses. That pizza box trick is real luxurious, but, you know, try not to start a fire.